In August, the IFAW Middle East and North Africa office organized a prevention of wildlife trafficking workshop in Mauritania. 40 participants from Ministry of Environment and Sustainable Development, customs and fisheries authorities in addition to participants from Morocco, Algeria and Tunisia participated in the workshop. Now, the impact of the workshop can be seen through the confiscations that occured in the following month. Earlier this month, a number of falcons (3 Pregrine falcons and 12 Hybrid falcon Gyr X Peregrine falcons) were seized at Rosso city which situated on the Senegal River (Border with Senegal). It is expected that the falcons were imported to be used for falconry practice in Mauritania in violation of Mauritania national laws. 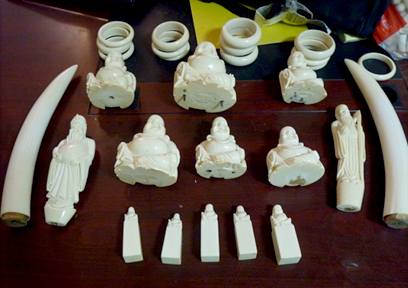 Also on the same day, but in Nouakchott airport, 34 Kg of carved elephant ivory was seized. The passenger tried to hide the ivory in his luggage below his clothes. In Central and West Africa, the elephant may soon disappear from whole areas unless urgent action is taken.